The 5' wide Moon Gate by Phil Beck hides the view of the utility road that services the extensive property. He can be reached through the Fire Dragon Gallery in Cannon Beach, Oregon. 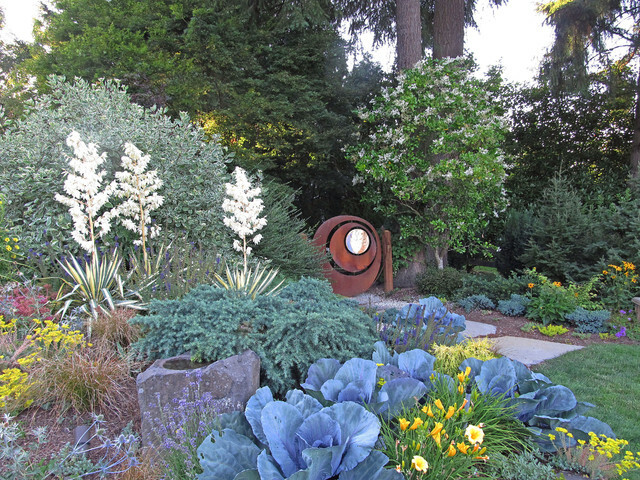 The bed to the left is lushly planted with yuccas (in bloom), ornamental cabbages, daylilies, sedums, several conifers including dwarf Blue Star Junipers. Behind the yuccas is a variegated dogwood with bright red branches throughout the winder. The grasses are Orange Sedge. Could we use this for a privacy wall for the hot tub? Love the colors in the plants chosen!